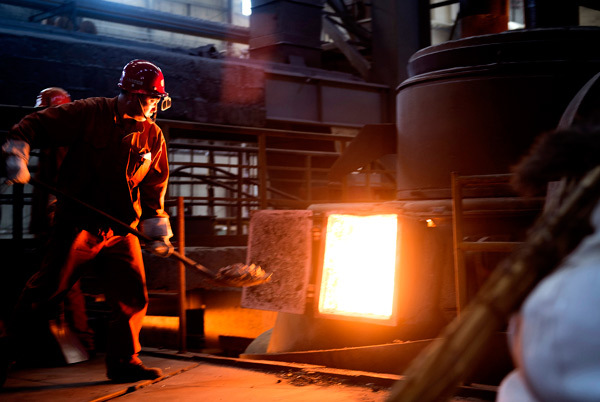 China's demand for steel has peaked and the coming 14th Five-Year Plan period (2021-25) will witness a decrease in steel consumption in the construction industry, while demand in the manufacturing sector is expected to remain at the same level, according to a senior official. During the period, steel consumption will mainly occur in the manufacturing industry, supplemented by needs in construction, said Shi Hongwei, director of China Steel Development & Research Institute, on Friday. Specifically, steel consumption is expected to remain 600 million metric tons per year, with the manufacturing sector taking up over 60 percent. Shi said that because steel products are always being upgraded, steel consumption in this sector will level off. "The lifecycle of a ship is approximately 25 years, while that of an automobile is roughly 10 years. According to the statistics by the China Association of Automobile Manufacturers (CAAM), China's automobile output last year was 29 million. Theoretically, in 2027, or 10 years later, these cars will turn into scrap steel, and there will be a demand for new steel. He pointed out that China has experienced two rounds of large-scale infrastructure construction periods in the past years. As infrastructure construction in the country matures, there will be a gradual decrease in steel consumption in related sectors during 2021 to 2025. "In the construction sector, the lifecycle of infrastructure is rather long, resulting in a demand decrease," Shi explained. As a pillar industry for realizing the Made in China 2025 initiative, the steel sector plays a crucial and active role in boosting the country's intelligent manufacturing. According to Shi, overall, the future of China's steel industry is still promising. China's demand for steel has peaked and the coming 14th Five-Year Plan period will witness a decrease in steel consumption in the construction industry, said a senior official.